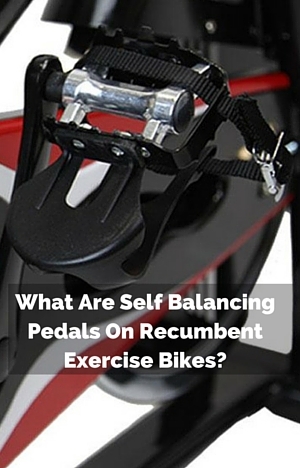 What Are Self Balancing Pedals On Recumbent Exercise Bikes? Some recumbent exercise bikes promote they have self balancing pedals. But don’t let you know what they are. Some even mention it along with the drive. It could make you think it is something to do with a smooth pedaling motion. But that’s not what the feature is about. These type of pedals have a weight on one side so they are always facing upright. The weight offsets the weight of the strap that many pedals have so the strap side is there ready for you to use. Otherwise the weight of the strap will have them always the wrong way up (as in the image). So they don’t have anything to do with the drive and the pedaling motion but can certainly make your life easier when getting started on the bike. It saves on the hassle of having to turn over the pedals before you can get your foot on the pedal and get going. If you can’t flick the pedal over with your foot to then be able to slide it into the toe strap you are going to have to bend forward to get first one foot on to a pedal and then do it with the next one too. It’s not much fun if you have back problems and don’t want to be leaning forward that much. You might have to get someone to help you. Or if you have a problem with a leg or legs you may also need someone else to help. For everyone else it is just going to be a small hassle. Fortunately it is something most bikes come with now as standard although they’re not listed as having them. (The Schwinn 270 doesn’t list them but it has a weight on one side). The self balancing pedals doesn’t give you a better or smoother pedaling motion. It does make your life easier when getting on the bike. You don’t have to try and flick the pedals over with your foot to get the pedals up the right way. If you can’t do it with your foot you may end up having to bend forward to be able to get the pedal up the right way up to be able to get you foot in to and on to the pedal. Which if you have back pain it kind of defeats the purpose. Many bikes now have this feature but it is not always listed in their product description.